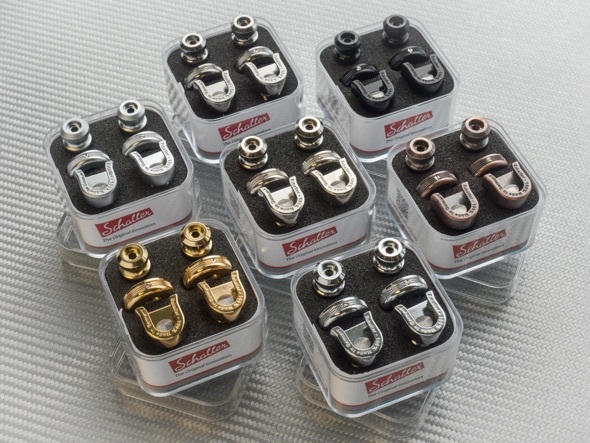 Schaller has expanded their strap lock options with the S-Locks Strap Lock system. The new design is comprised of three components: the strap button, a lock, and a lock-wheel. While there are several updates to the set, the lock-wheel is the most obvious. It screws down onto your strap to ensure a secure hold without the need for tools. However, if you want a tighter fit, a hole for a 2mm Allen wrench or screwdriver can give you more torque. Finally, a threaded pin with a cone point keeps the lock wheel in place. 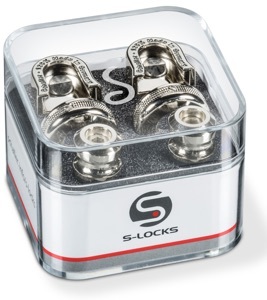 Other upgrades include a new ball design, a new bolt design, a larger lock thread to hold up to 6mm straps, and silent use. Avoid accidents, get Schaller Strap Locks. Special strap buttons for the guitar and special locks for the strap keep your favourite bass safe and secure.